Opening the Washington Post today, we were aghast. 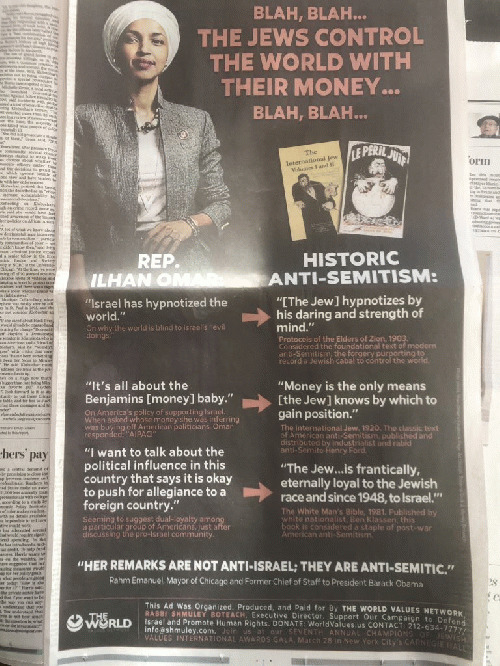 Prominently displayed on page 8 was a full-page ad falsely accusing Representative Ilhan Omar of being anti-semitic. "The Jews control the world with their money" - words Rep. Omar NEVER said - were splattered next to her face, leaving readers to assume it was a quote. The ad was produced and purchased by the notorious Rabbi Shmuley, a hate-monger whose agenda is well-known: to demand U.S. compliance with Israel's status quo of occupation and apartheid. Why is the Washington Post allowing Shmuley to purchase such an outrageous ad inciting hatred against the first black, Muslim hijab-wearing member of Congress? Contact the Washington Post now. Tell them to apologize to Rep. Omar and promise not to print ads that propagate lies and hate. We will hand deliver your signatures to the Post. As Congresswoman Rashida Tlaib wrote: "This is a false ad that only serves to incite violence toward a Black Muslim woman. It's fear-mongering and we need to stand together and say this type of hate should not have a place in our newspapers or society." We know the results of inciting such hatred: We just saw the murder of 50 Muslims in New Zealand with the shooter crediting President Trump as an inspiration to white nationalists across the world. The stakes are higher than ever right now. After years and years of Congress providing unquestioned support for Israel and kowtowing to the Israel lobby, we now have members of Congress openly supporting the boycott, divestment, and sanctions movement. And for the first time ever, nearly every Democratic presidential candidate is refusing to attend the AIPAC conference happening in Washington, D.C.
Skipping AIPAC used to be considered political suicide, but now it's AIPAC that is toxic. No one looking to establish their progressive credentials wants to be associated with blind support for the apartheid state. That's why Rabbi Shmuley is desperate to frame Rep. Ilhan Omar as an enemy of the Jewish people. The Washington Post knows what Rep. Omar has and has not said; it knows that Rabbi Shmuley's ad is misleading and repulsive. So why print it? Do you have a moment to contact the Washington Post? Tell them you expect better from them, especially during this time of heightened violence and while Rep. Omar is experiencing very real death threats. They should promise to never again sell space in their paper for ads promoting any kind of hatred! Rabbi Shmuley's ad is misleading and toxic. Rep. Omar has gotten death threats! Allowing such an ad to run is promoting Islamophobia and terrorism, are you turning into Donald Trump? Fifty Muslims were killed in New Zealand, inspired by the Islamophobia of Trump. Is the WaPo jumping onto this hatemongering bandwagon? Please get a grip. Rep. Omar is entitled to an apology from the WaPo. As someone who disagrees with just about everything Rep. Ilhan Omar says, she is correct that in Washington, D.C., 'it's all about the Benjamin's'.